Without the proper safeguards, simple use of an outlet may lead to an electrical shock or burn due to improper use or to adverse conditions like damaged cords or appliances and the presence of water or dampness. 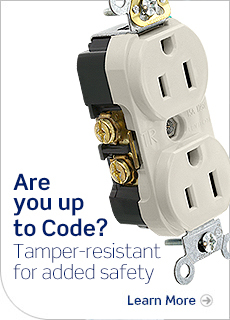 That’s why GFCI outlets and Tamper-Resistant outlets are important – and required – safety devices for every home. 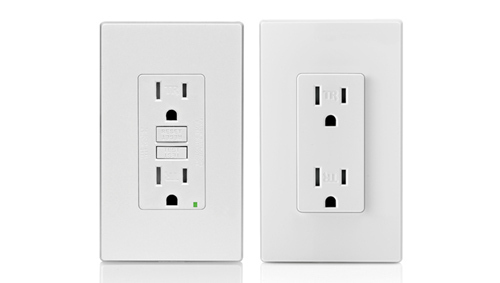 So, what makes these outlets different from traditional outlets? Let’s start with GFCIs. Unlike traditional outlets which simply provide a means to channel power, GFCI outlets operate by continuously monitoring the current flow between the “hot” and “neutral” conductors in an electrical device. When functioning properly, all the current flowing through the “hot” conductor is returned through the “neutral” conductor. However, when current is flowing outside of the normal path due to frayed wires, damaged devices or other conditions, not all current flowing through the “hot” conductor is returning through the “neutral” conductor. This scenario creates a dangerous condition for a person touching the electrical device and may result in shock or electrocution (Figure 1). 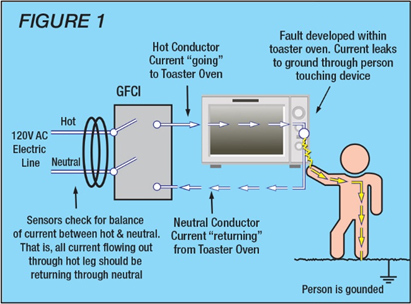 It is the job of the GFCI to detect irregularities in current flowing between the two conductors and respond by interrupting power (tripping) instantaneously to prevent injury. The “tripping” process is achieved when the solid-state circuitry detects a potentially hazardous condition and causes the switching contacts to open and de-energize the circuit. This is done in a split second; in time to prevent injury to a person who may be in the path of the current flowing in the unwanted path. Product standards and performance requirements are based on this information and engineers use this information when designing GFCIs in order to make them as effective as possible when in use. Once installed, the best way to verify that a GFCI is providing protection is to test it on a monthly basis. All GFCI outlets have clearly marked “TEST” and “RESET” buttons on the face of the device, providing a simple, distinct means to conduct this testing. And now, there is a technology that can supplement manual testing and regularly conduct an automatic test of the circuit. This technology has been incorporated into a UL standard requiring all GFCI receptacles to have a self-test function; which improves safety for end users by confirming that the GFCI can respond to a ground-fault. And, if not, the GFCI either takes itself out of service or the user is given an indication that the device needs to be replaced. Leviton offers a wide variety of GFCI devices, including hospital grade and cord sets, for protection in the home, industry, outdoor work site, or wherever electrical products are used in damp or wet locations. Remember, these devices are designed to reduce the occurrences of serious injury or death associated with electrical accidents and therefore are a must for optimal personal protection and safety. Tamper-Resistant Receptacles are uniquely designed to help protect children from the potential dangers associated with “playing” with receptacles. They were developed in response to the ongoing number of injuries sustained by children as a result of attempting to stick objects like keys, hairpins, paper clips, pens and other objects into receptacle slots. Tamper-resistant receptacles contain a shutter mechanism which blocks access to the contacts unless a two or three pronged plug is inserted. When pressure is simultaneously applied to both sides, the receptacle shutter opens to allow the standard plug to make contact with the receptacle contacts. Without this simultaneous pressure, the shutter remains closed, preventing insertion of foreign objects. This not only prevents children from inserting foreign objects into the receptacle but protects adults as well. For instance, if the blades on a plug are damaged or bent the shutter will not allow it to be inserted; doing so could result in shock or damage to the appliance. According to the Consumer Product Safety Commission, each year, approximately 2,400 children suffer severe shock and burns when they stick items into the slots of receptacles. It is estimated that there are six to twelve child fatalities a year related to this behavior. Tech Talk – Humidity Sensor and Fan Control Works Like Magic, Making Humidity Disappear!